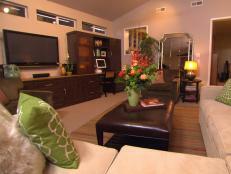 The smallest room in your house doesn't have to skimp on style. Be inspired by these 30 designer powder rooms that are short on square footage but big on style. 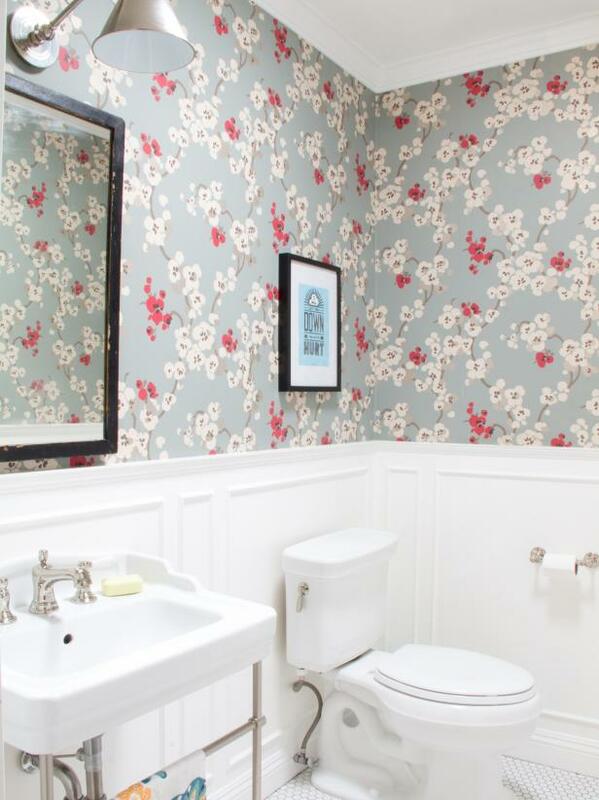 A small powder room is the ideal place to add a bold touch to your home. 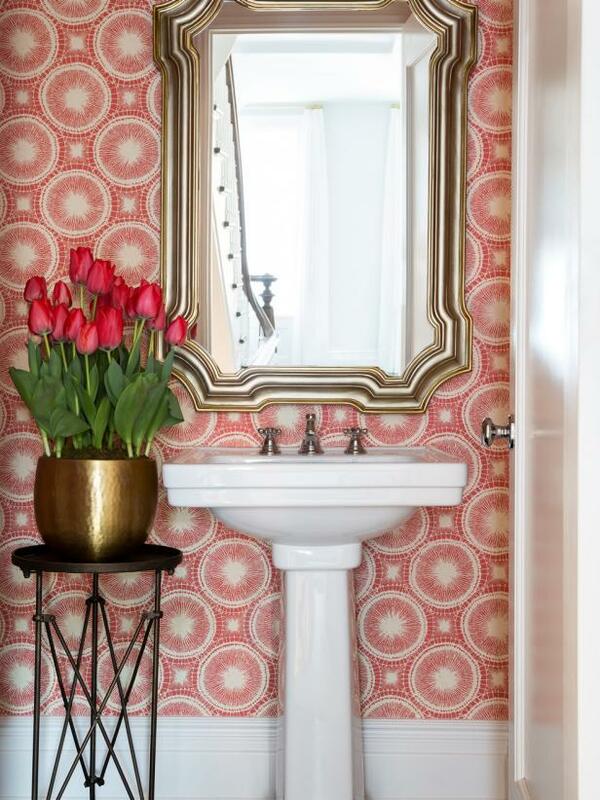 Playful pink wallpaper sets the scene in this eclectic space, which pairs a simple pedestal sink with a glamorous mirror. A tripod table provides the perfect spot for setting fresh flowers, a must-have for bringing life to any room. 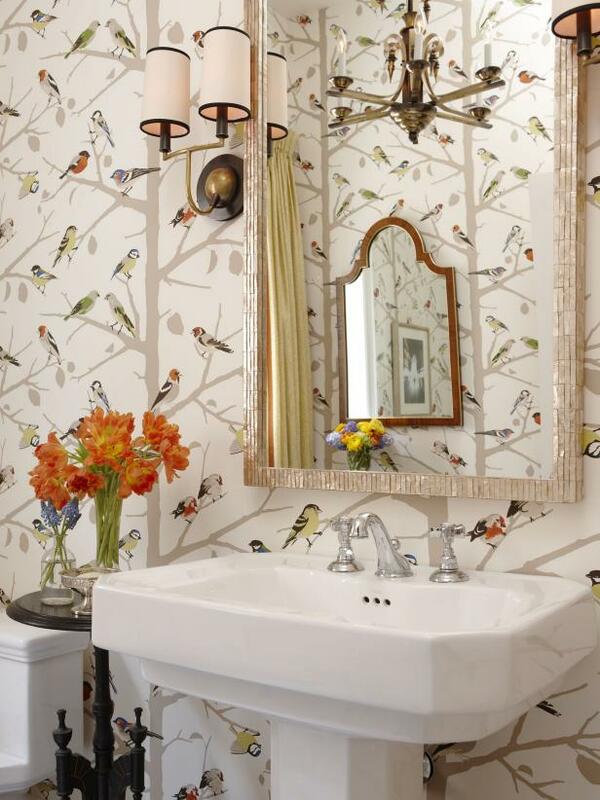 Whimsical bird wallpaper is the real showstopper in this eclectic powder room. Designer Sarah Richardson loves using vintage light fixtures, like the sconces and chandelier here, in her spaces to create a timeless feel. 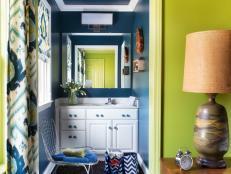 Ikat wallpaper in soft blues and greens adds a splash of color to this neutral powder room. A blue bead chandelier is a playful touch and is reflected in the elegant quatrefoil mirror. A small floating sink with glass countertop takes up little room and brings a contemporary note to the room. 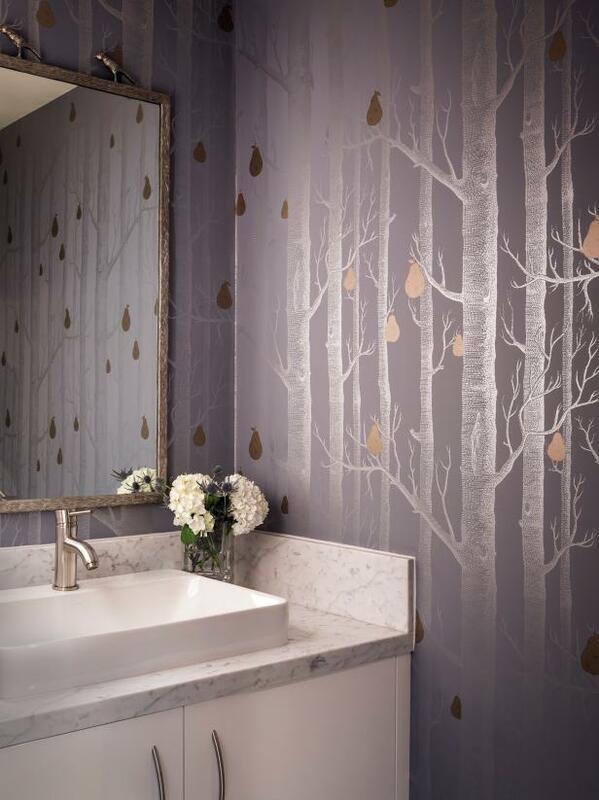 Slate gray wallpaper with silver trees and golden pears creates a romantic forest atmosphere in this contemporary powder room. 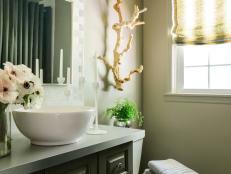 A sleek white vanity is topped with beautiful marble countertops and an elegant vessel sink. 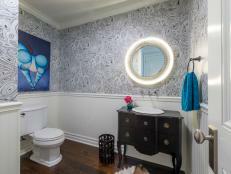 In this eclectic powder room, guests are greeted with a bold, whimsical wallpaper featuring black-and-white peacock feathers. Pedestal sinks often look contemporary, but designer Allison Lind chose one with a column base and soft, curvy lines to add a more traditional style. A large round mirror brings the silver hue of the hallway into the bathroom and helps to visually enlarge the space. 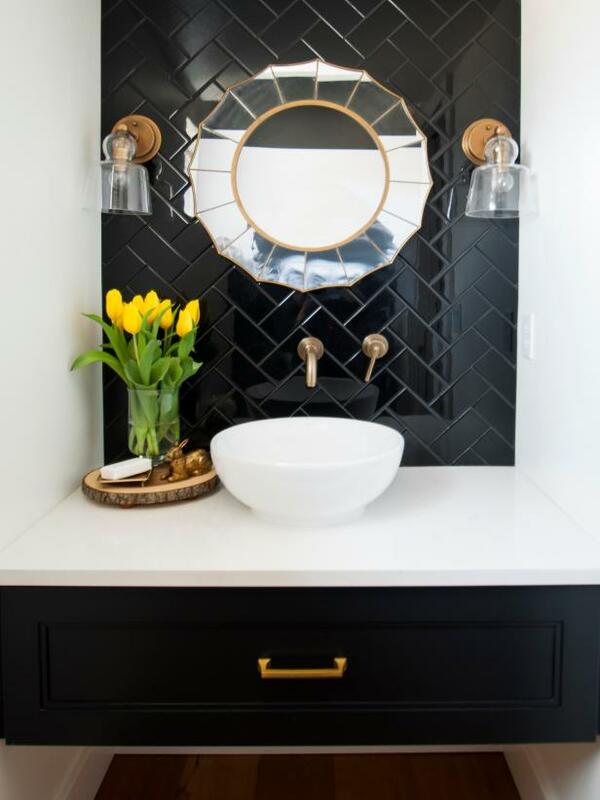 Classic meets contemporary in this glossy black backsplash laid in a herringbone pattern. 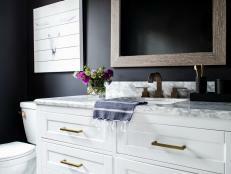 A streamlined white countertop creates a striking contrast against the traditional black front of the floating vanity, while touches of gold bring a glamorous element to the space. 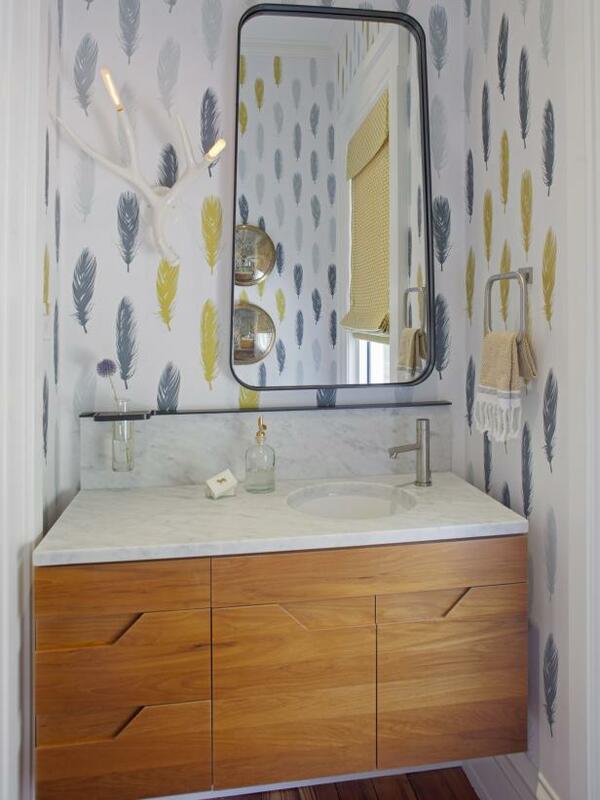 The whimsical wallpaper in this small bath features feathers in soft yellows and grays. The floating vanity combines warm woods with cool countertops, a display in balance. And for a playful touch, an antler sconce is hung next to the mirror. 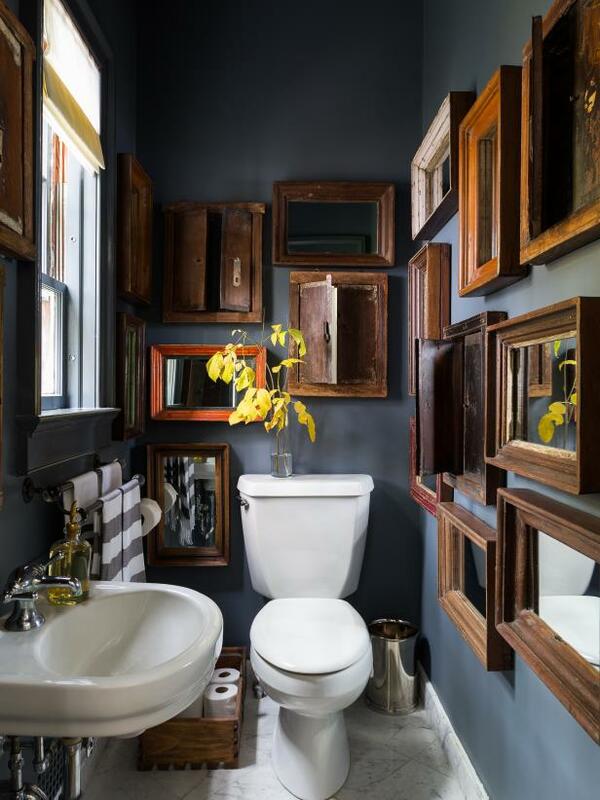 Vintage finds are a great way to infuse your powder room with personality. 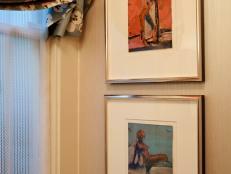 Antique mirrors, frames and even cabinet doors are hung all around this eclectic powder room for a warm, lived-in feel. Marble tiles laid diagonally ground the space, while chrome and white fixtures balance the rustic quality with a contemporary edge. 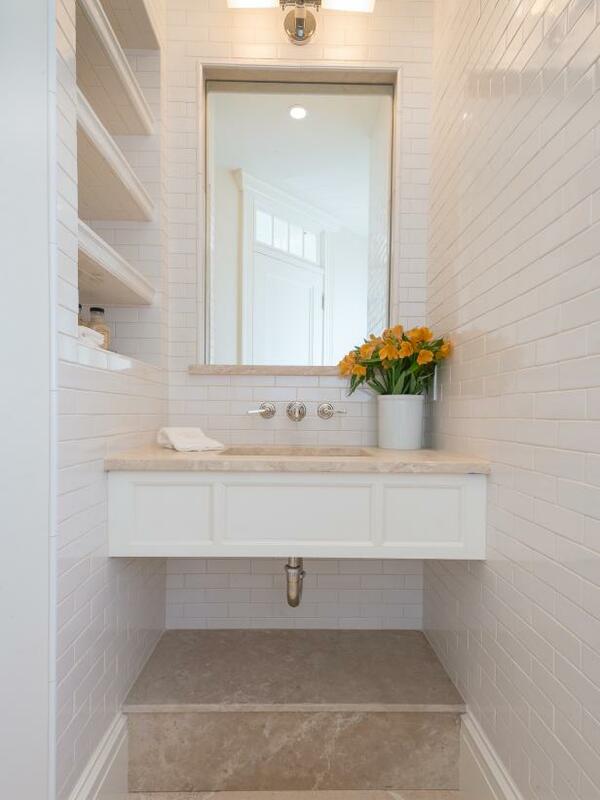 Since powder rooms are usually the smallest space in the house, they're the perfect candidate for trying an elaborate (and potentially costly) design. 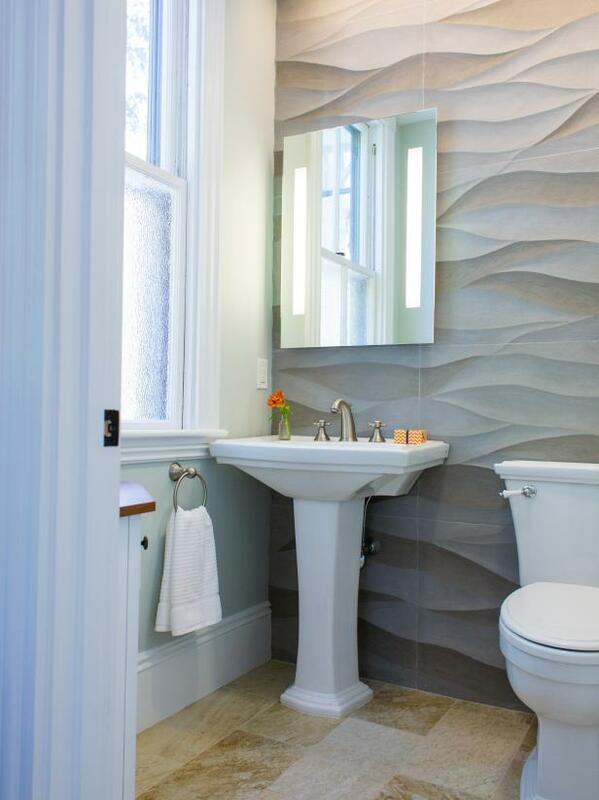 This contemporary bathroom features river rock accent walls, bringing earthy texture to the space. Gray walls add depth with a slight metallic sheen, and a streamlined vanity, mirror and sconces bring in a contemporary style. Pedestal sinks are a great choice for powder rooms since they take up less space and under-counter storage isn't always a necessity. In this contemporary bathroom, sculptural tiles in a neutral gradient from soft sand to light charcoal create a wavy accent wall. A simple mirror is suspended from the wall to look as if it's floating. 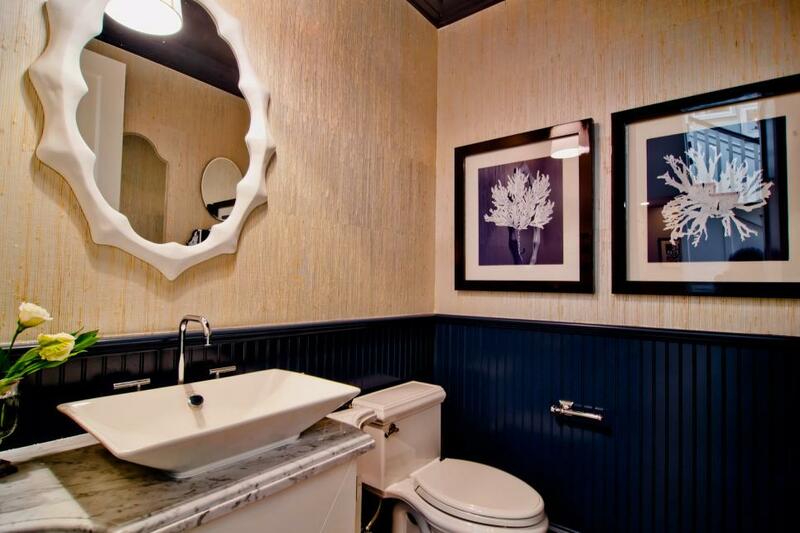 Navy blue wainscoting is paired with metallic gold grasscloth in this eclectic bathroom. A funky white mirror hangs above a contemporary vanity with sleek vessel sink while framed coral prints add a nautical touch. A neutral color palette doesn't have to be boring. Use a variety of materials to create an eye-catching display for visual interest. 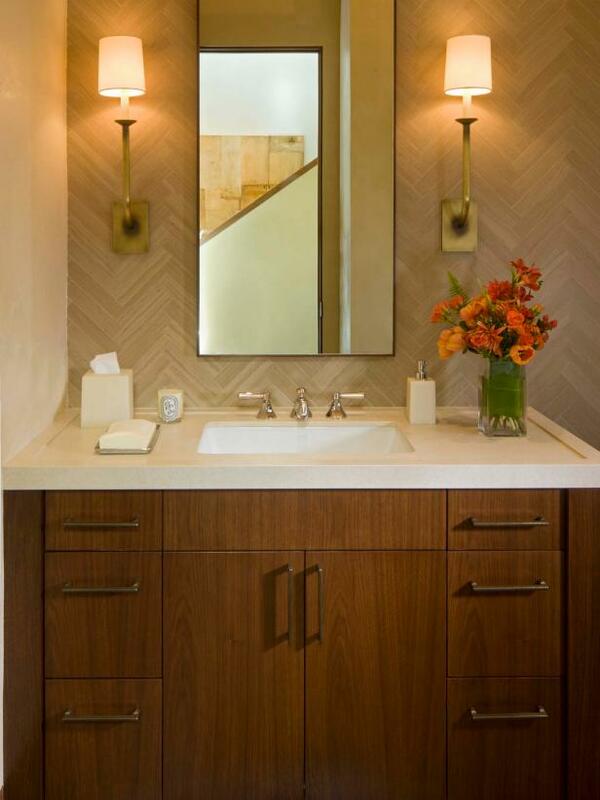 The backsplash in this contemporary bathroom is stunning with limestone tile laid in a herringbone pattern. 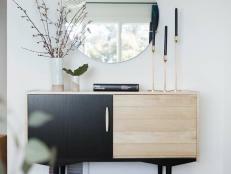 The vanity features a low-profile faucet and sleek cabinet handles for a clean, streamlined look. 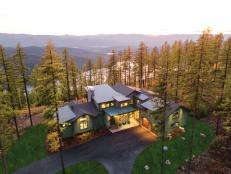 Curvy lines and a soft palette are key to evoking a romantic style. 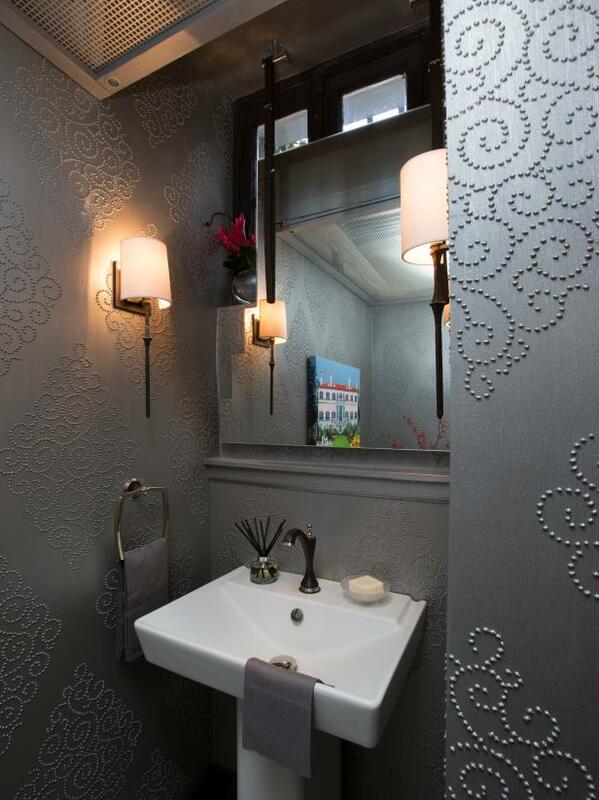 Elegant silver, from the floral wallpaper and upholstered door panel to the hammered nickel sink and wall-mounted faucet, carries the eye throughout this feminine bathroom. A rounded, natural walnut vanity is topped in Calacatta marble. 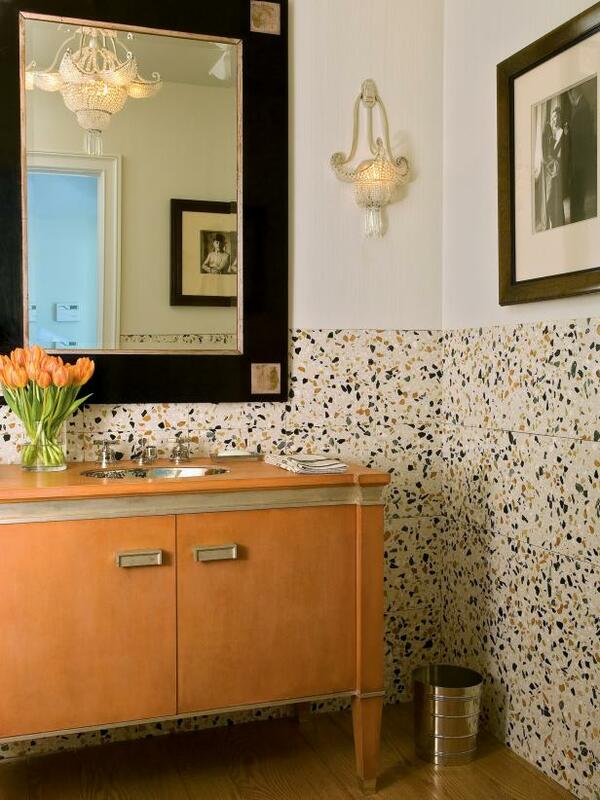 Creamy white walls combine with multi-hued terrazzo wall tile in this eclectic powder room. The light orange shade of the stone speckles is pulled out to create a custom vanity. A lavish chandelier and sconce bring a sophisticated, romantic vibe to the room. 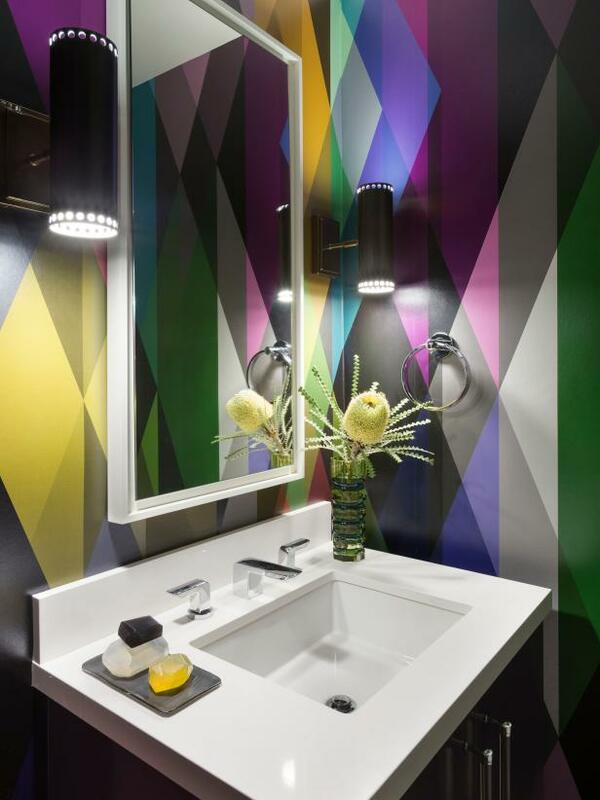 Bold, geometric wallpaper in rich jewel tones is a wow-worthy backdrop to this funky powder room. 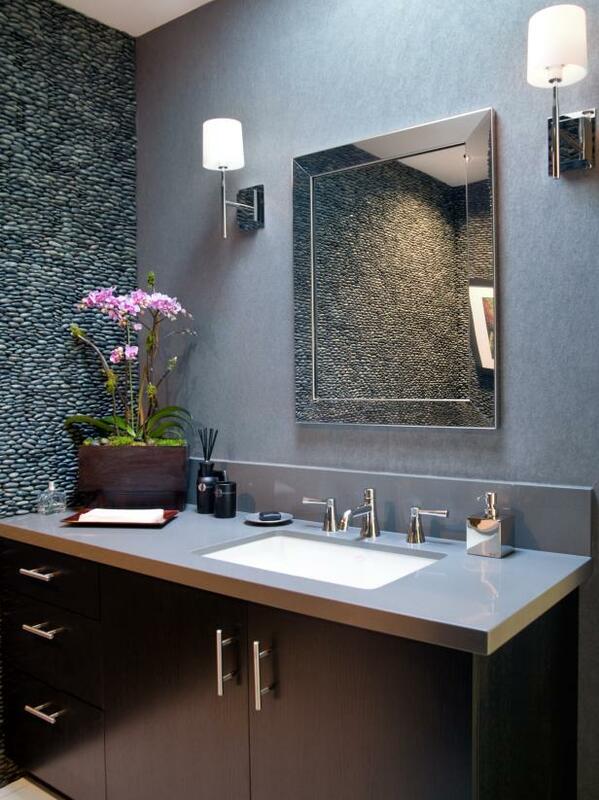 The sleek, straight lines of the vanity, faucet and mirror bring a contemporary edge to the room, while cylindrical black sconces create soft mood lighting. 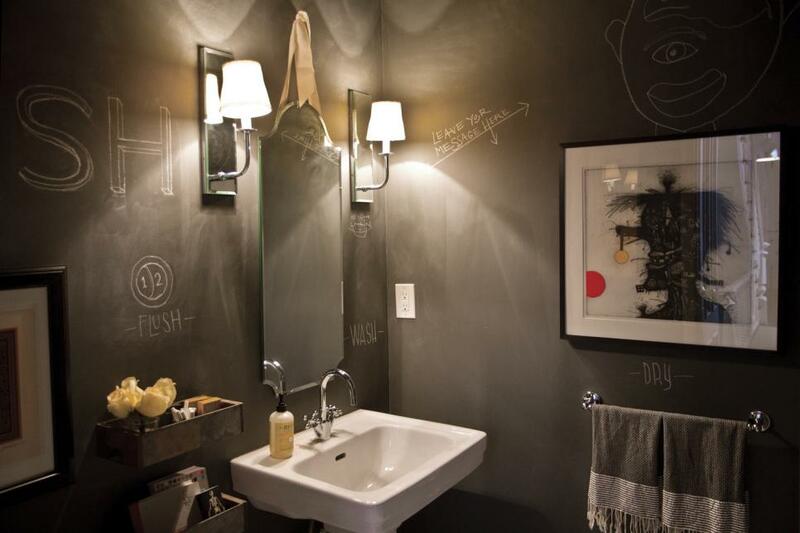 A surefire hit with guests are the chalkboard paint walls in this quirky powder room. 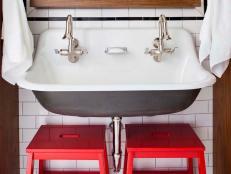 A galvanized shelf beside the pedestal sink houses the chalk for leaving a fun message on the walls. 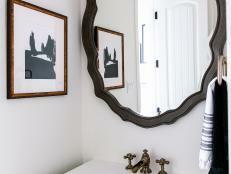 Mirrored sconces are paired with a hanging mirror to help bounce light around the dark space. 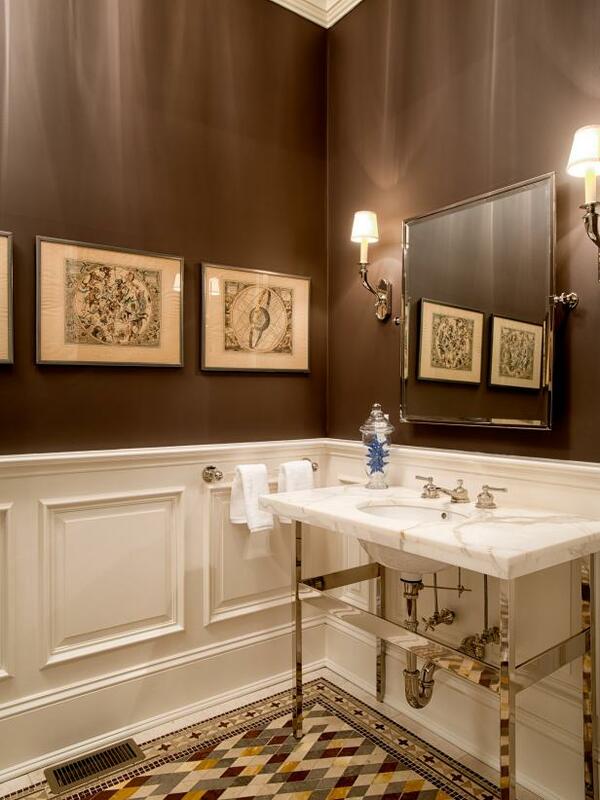 Traditional wainscoting pairs with dark chocolate walls for a classic look that's both warm and welcoming. A beveled-edge mirror adds a subtle flourish above the console sink, which mixes contemporary chrome legs with an elegant marble countertop. Intricate floor tilework in muted earth tones provides style underfoot. 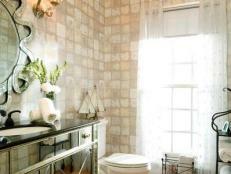 In this powder room, earth-toned mosaics mix with tumbled square tiles for a warm, Tuscan-inspired vibe. The show-stopping bright blue vessel sink acts as a piece of art and really stands out against the neutral backdrop. Classic wainscoting contrasts against whimsical black wallpaper with colorful butterflies in this eclectic powder room. 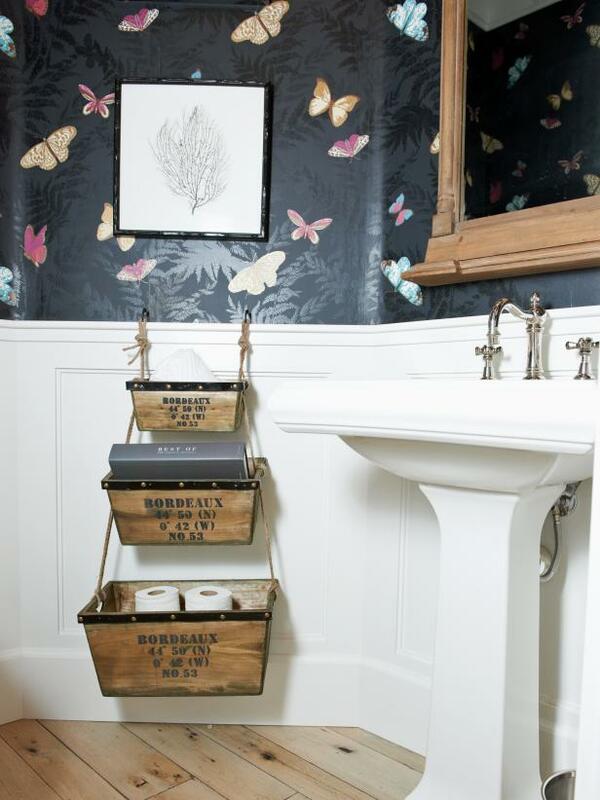 Rustic French-inspired storage bins are hung on the wall for pretty yet functional storage. 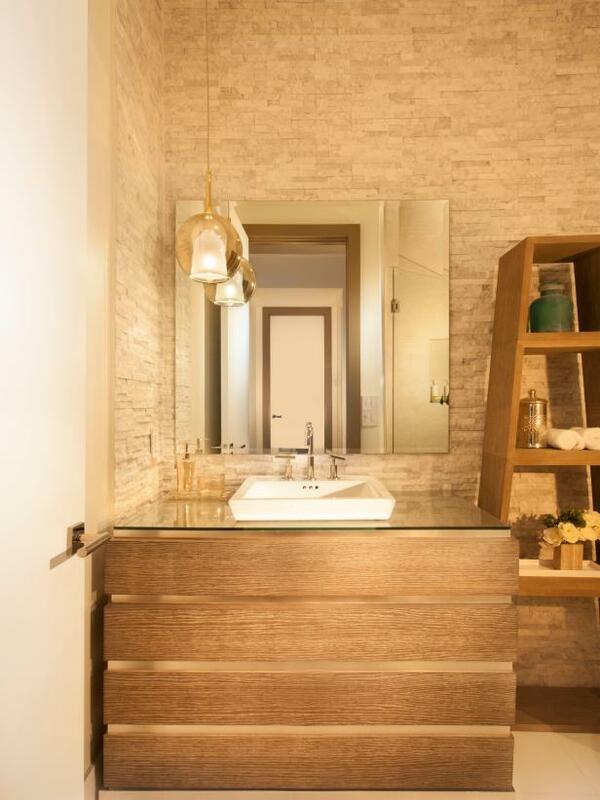 Lean and polished, the pedestal sink makes the space feel airy, while the mirror helps reflect light around the room. 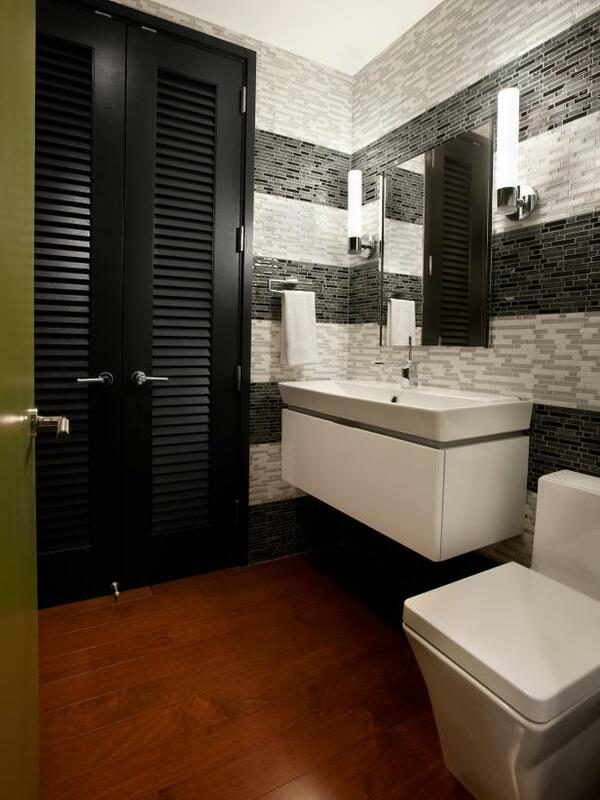 Wide horizontal stripes made from black and white rectangular tiles make a big design statement and help to visually expand the space in this powder room. The strong square lines of the floating vanity and toilet give the space an ultra-modern touch while hardwood floors add warmth. An intricate wallpaper is best complemented by classic, white wainscoting that holds its own without stealing the show. A simple console sink is a great option for small bathrooms since they take up less space and maintain an airy, open look. 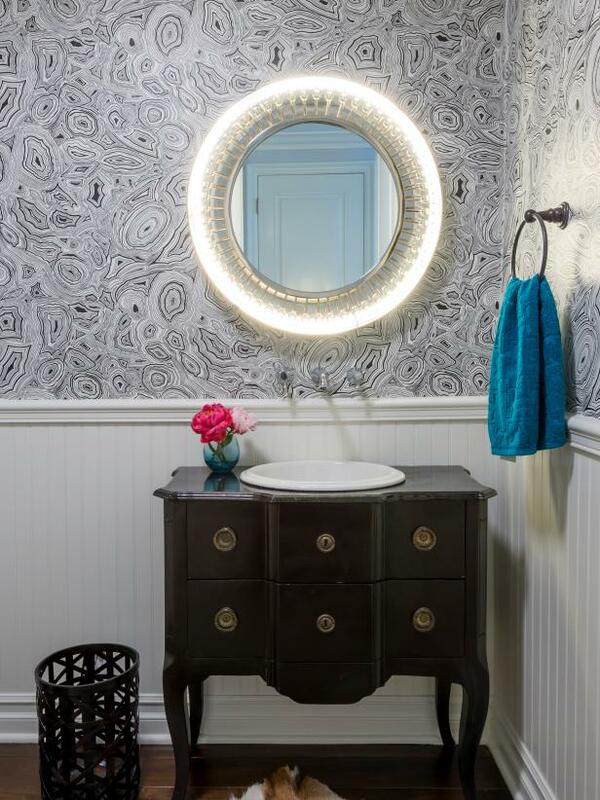 A favorite designer trick to creating a one-of-a-kind powder room is to repurpose an antique dresser into a vanity. Contemporary meets traditional when the graphic black-and-white wallpaper is paired with white beadboard and chair-rail molding. 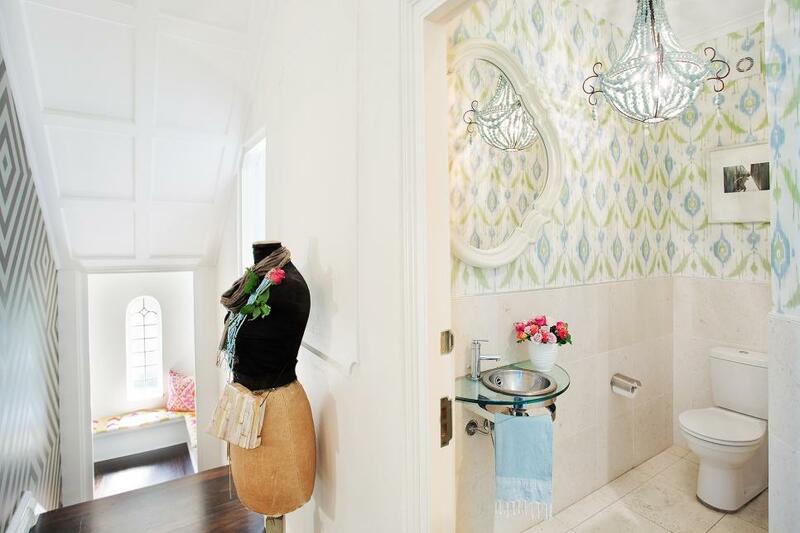 Smart design solutions make the most of this narrow powder room. 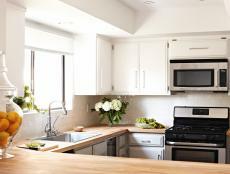 White subway tile is not only stylish, but it helps to visually expand the space in every direction. A floating vanity keeps the space airy and open while deep built-in shelves provide needed storage and even the mirror is inset to create the illusion of more room. 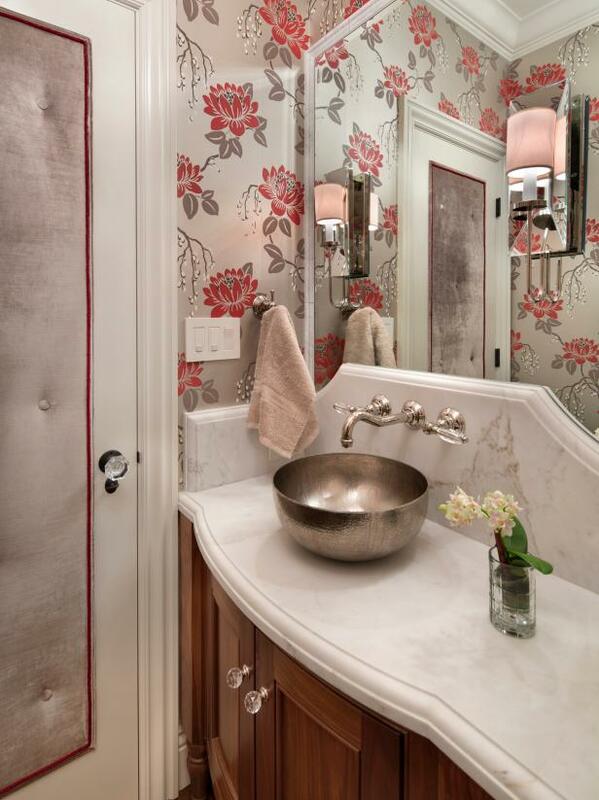 Glamour knows no bounds in this richly decorated powder room. 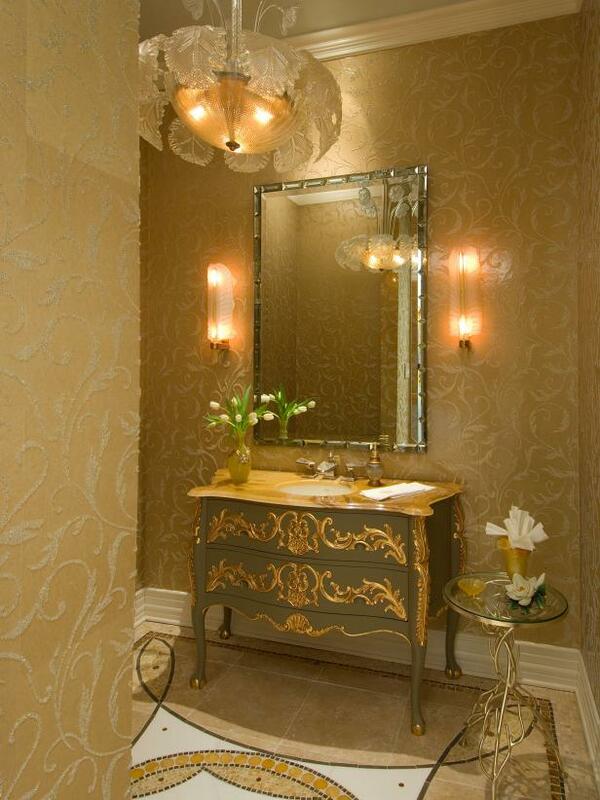 Flocked filigree wallpaper brings texture to the space while a gilded vanity is topped with gold marble. 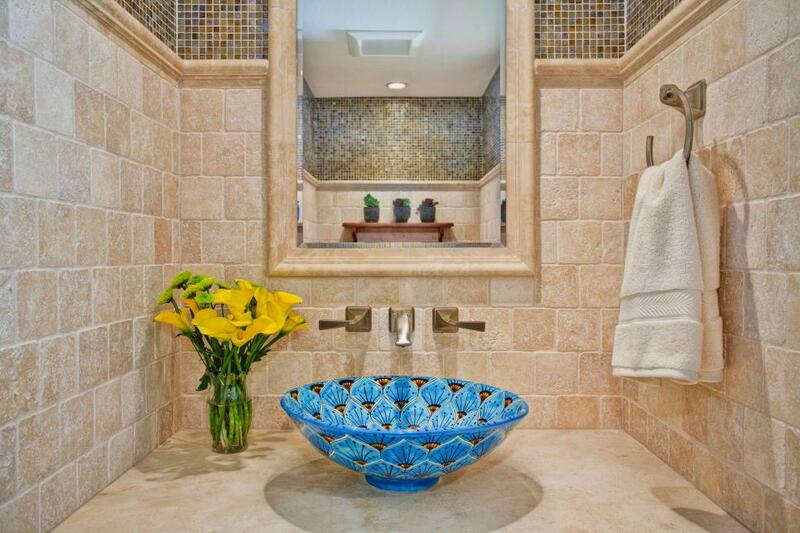 Inset on the stone floor is custom mosaic work featuring 24-karat gold glass and onyx tiles. 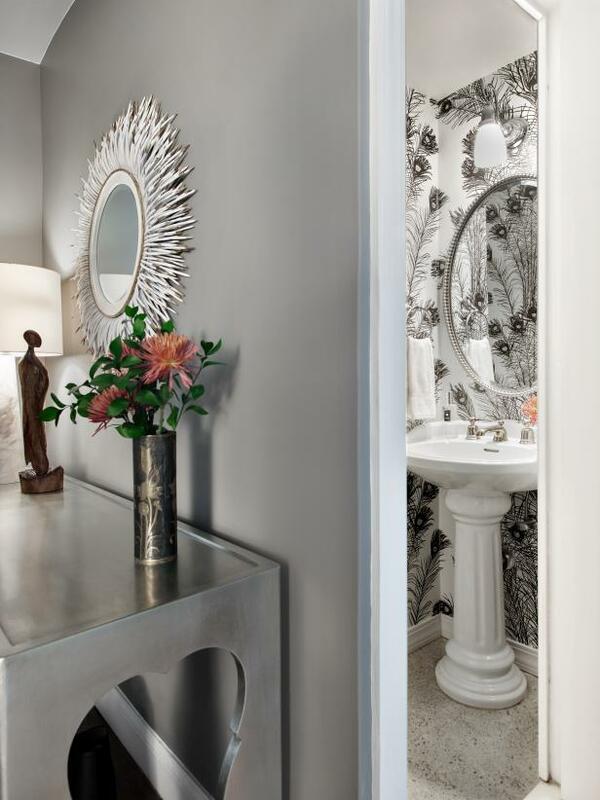 Soft gray walls with a metallic sheen bring the drama to this small bath. Raised, swirling detail adds texture and sophistication to the space while small windows combined with the mirror help channel light throughout the room. Taking a cue from the homeowners' ardent love of scuba diving, the powder room reflects their enjoyment of the sea. 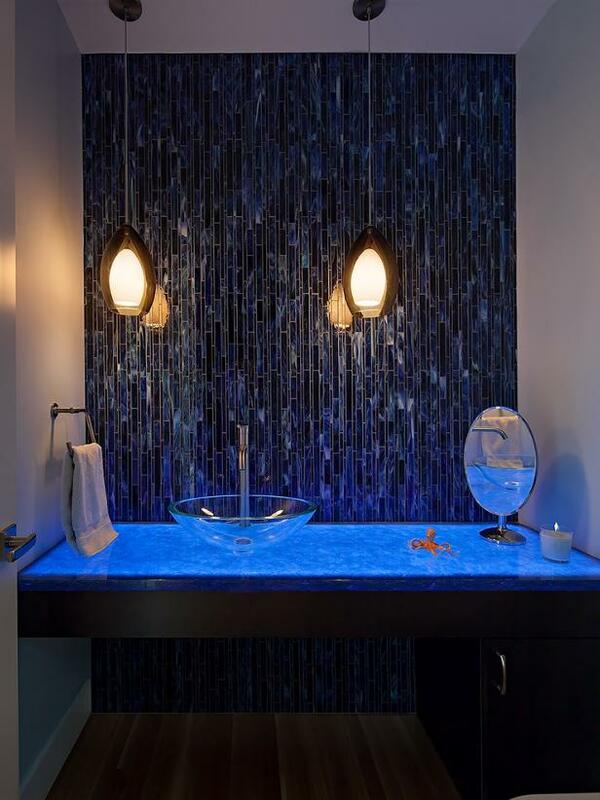 Deep blue tile is laid vertically, creating a cascading water effect, and the brilliant blue countertop is lit from beneath and looks as if you could dive right in. 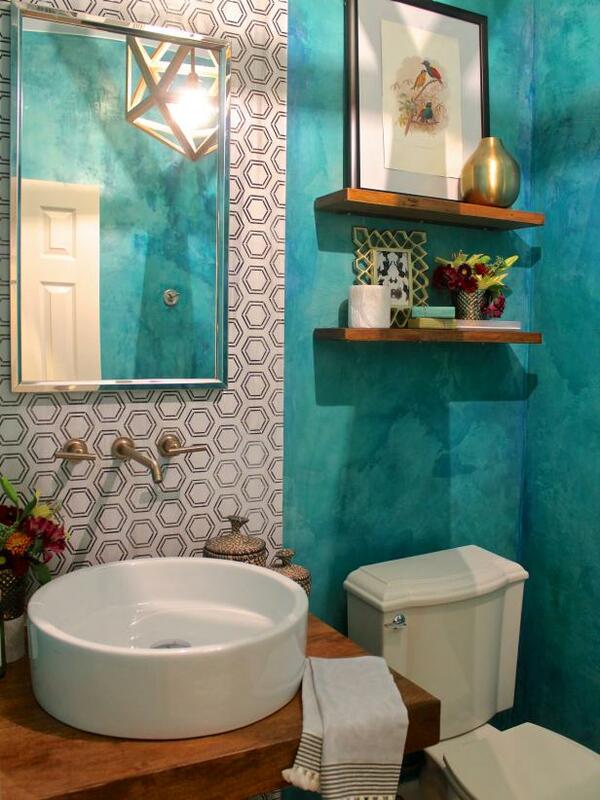 This colorful powder room feels refreshingly new with graphic, hexagonal tile and Venetian plaster teal walls. Organic elements, like the rustic wood countertop and floating shelves, are paired with contemporary fixtures, like the vessel sink and wall-mounted faucet. Stone walls set the backdrop for this contemporary bathroom where the vanity combines rustic wood drawers with a glass countertop and vessel sink that looks like it's floating on top. 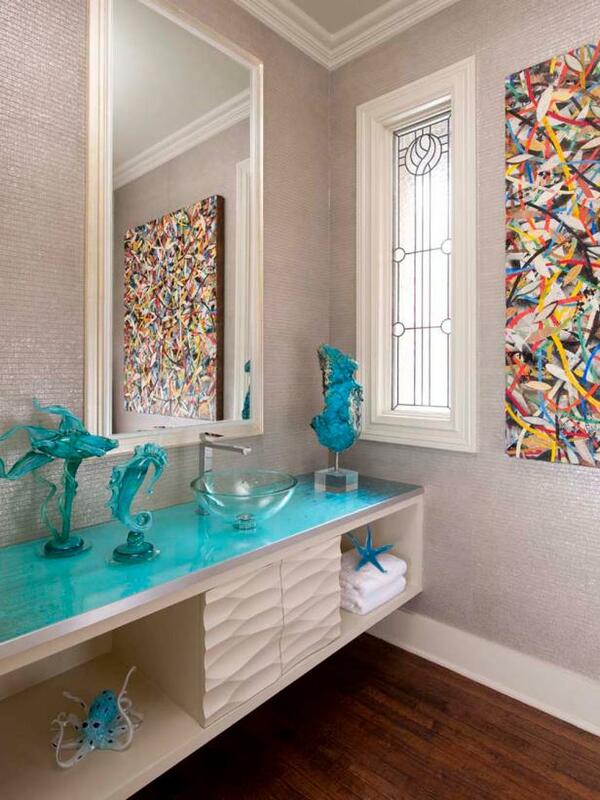 Shimmering silver wallpaper lends this powder room a glamorous backdrop while the floating vanity has both closed and open storage and is topped with a turquoise glass countertop for a brilliant pop of color. 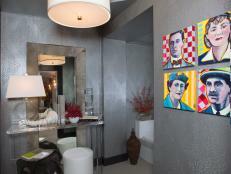 A large piece of abstract artwork brings a contemporary element to the space. 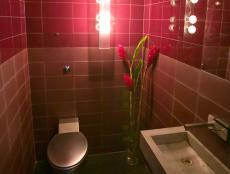 Rich browns lend a soothing atmosphere to this contemporary powder room. 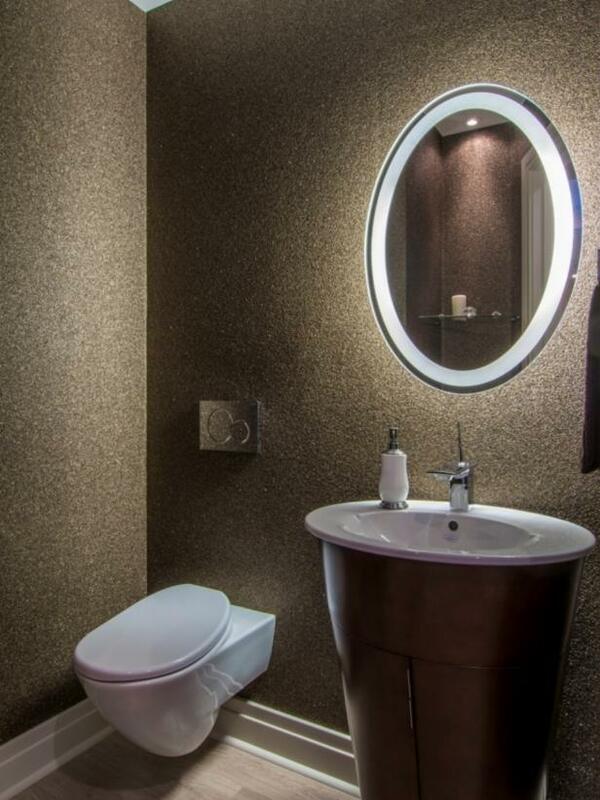 A cool wall treatment creates a metallic, bronze finish, while a floating toilet and sleek vanity bring a modern edge to the space. The oval mirror is back-lit, emitting a soft glow.